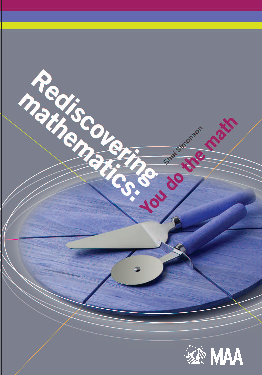 Rediscovering Mathematics is aimed at a general audience and addresses the question of how best to teach and study mathematics. The book brings the exciting and dynamic world of mathematics to a non-technical audience. With so much focus today on how best to educate the new generation and make mathematics less rote and more interactive, this book is an eye-opening experience for many people who suffered with dull math teachers and curricula. Rediscovering Mathematics is an eclectic collection of mathematical topics and puzzles aimed at talented youngsters and inquisitive adults who want to expand their view of mathematics. By focusing on problem solving, and discouraging rote memorization, the book shows how to learn and teach mathematics through investigation, experimentation, and discovery. Rediscovering Mathematics is also an excellent text for training math teachers at all levels. and applications of probability to sports, casinos, and gambling. Rediscovering Mathematics provides a fresh view of mathematics for those who already like the subject, and offers a second chance for those who think they don’t. The book is used in Mathematical Reasoning for Education at Stonehill College. Look inside at the table of contents. Play the Guessing Game.